Ready to shop? Links are to the left! “How do I know what size pump to buy for my water garden?” This question is posed every day to us by new water gardeners and those looking to make a change in their pond. The question is answered at first with another question, “What are you going to use the pump for?” Most first time pump buyers are led to believe that the pond size is what matters the most when choosing a pump. Nothing could be farther from the truth. First of all, a water garden does not have to have a pump at all if it has enough plants in it. To have the sound moving water or the visual effect of moving water, you have to have a pump to make it happen. If you plan to have a fountain or a statue, it doesn’t take much water flow, so you can use a small pump. A popular water feature is the gurgling geyser. 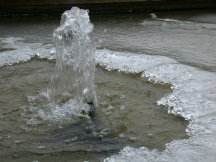 The bubbling sound is made by the water being forced to the surface through a pipe that is attached directly to the pump. Since this doesn’t require a lot of water for the effect either, a small pump can still be used. Choosing the pump for a waterfall is where most folks need a bit of help. Please read the article Choosing a Pump for tips on selection of the pump for your water garden needs. The first thing that you need to know is how large is the waterfall going to be? How far away from the pond does the waterfall start? Most important of all, how high is the fall going to be? Once these questions are answered, the pump can be chosen based upon these criteria. Notice that we never talked about how big the pond was, just how big the falls were. Obviously, you can’t install a Niagara Falls in a small patio pond, so there are some limits. It’s nice to keep the scale of the garden in mind when deciding on the size of a waterfall, after all, it has to look natural, unless a large falls is what you want. Most gardeners want the waterfall to look as natural as possible, like nature created it. Keep in mind when building the waterfall that the sound it makes will increase with the flow and turbulence. If the pond and falls is located next to a patio where you sit around and talk, then a high flow falls may overwhelm conversation. You may have to tone down the falls if it becomes too loud. Higher pitch sounds from water hitting on rocks carries less distance and is less audible than the deeper sound of water hitting on the pond surface. Make sure the pump is sized according to need and you can avoid adding extra valves and fittings. Consider the sound and size of what you want the waterfall to be, and pick the pump that suits your budget.